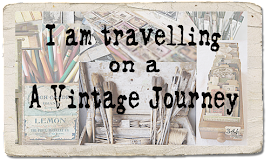 I decided to use my travel bag goodies to make a chunky ATC. I love being able to cram a lot of items in a small space and by using thick cardstock this meant I could really go to town with paint and embellishments. 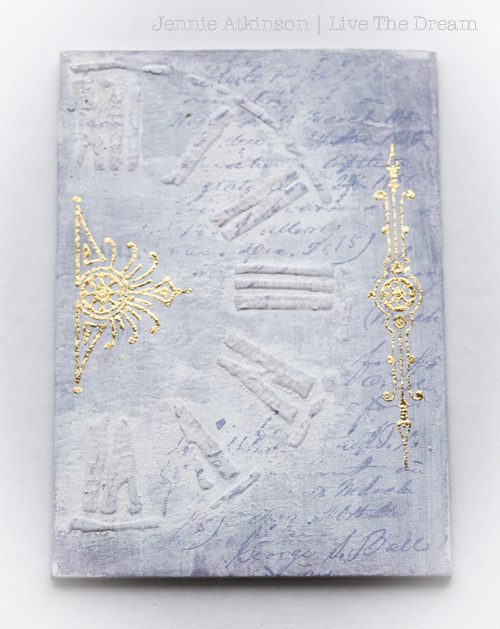 My greyboard ATC was first coated with gesso and then some crackle paste added with a stencil. I used Dusty Concord Distress Spray Stain and LOTS of water to get this faded look. Next, a little overstamping with a text stamp and Dusty Concord Distress Ink (second generation stamping to get a faded look). It was still needing something else and the new Tim Holtz Metallic Rub Ons are just a perfect size for an ATC and provide a bit of "class"! Then I started playing around with different embellishments. 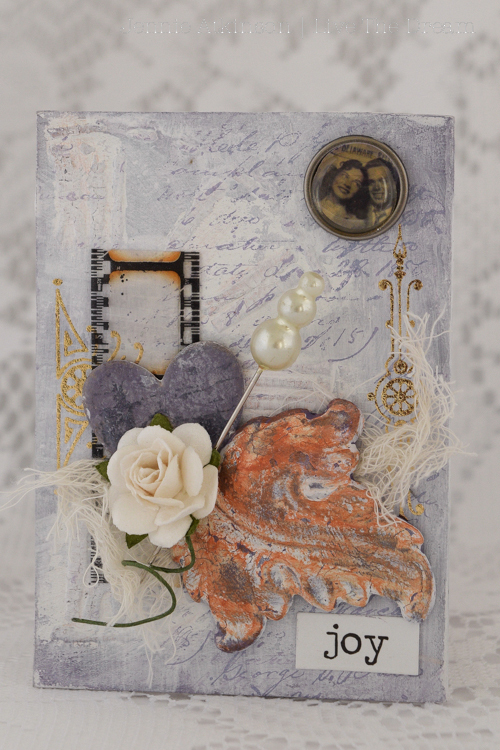 This greyboard heart was painted in gesso and dabbed with Dusty Concord Distress Ink and then overstepped with a crackle background stamp. I really love this effect. 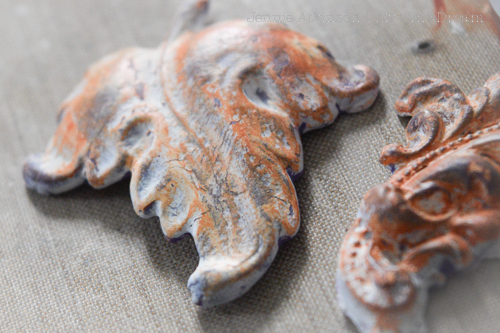 For my rusting element I decided to again "rust" a piece of paper clay with DecoArt paint and Antiquing Cream. If you missed my tutorial for this at the beginning of the month click HERE to go the post on my blog. This really is a fun technique and no-one would ever know it was paper clay! Finally I added a little more metal in the form of a picture brad and a pin. A little project but still using all the travel bag goodies. Three of my fellow Creative Guides have already shared their inspirational pieces with you this month as part of the Destination Inspiration journey, but in addition, as the Travel Bag is also this month's theme, you have been treated to a huge array of inspirational projects from the rest of the Creative Guides and our Challenge Winner and Pinworthies. If you are still inspired but haven't entered you still have a few more days to get those projects in. 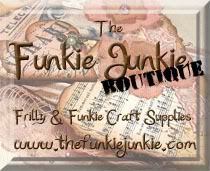 And I hope my little ATC shows that it doesn't have to be a big project - even small ones can cram in all the goodies !! As we are now at Terminal 4 it is time to share with you the four projects made by the Creative Guides with the March Travel Bag - all so very different and yet all based on the essential craft items in the bag. 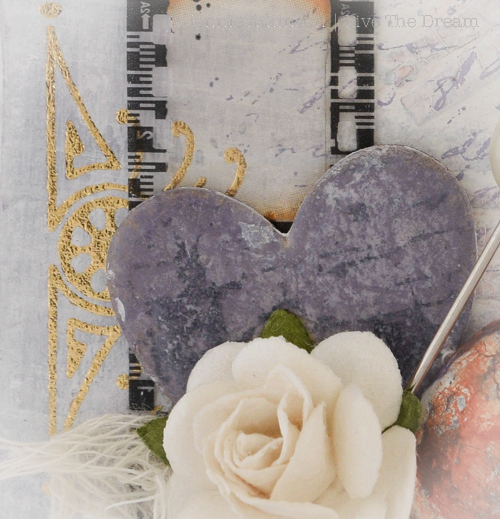 Next Monday there will be a new set of crafty items in our Travel Bag so do join us again next week to see what the Creative Guides are working with! 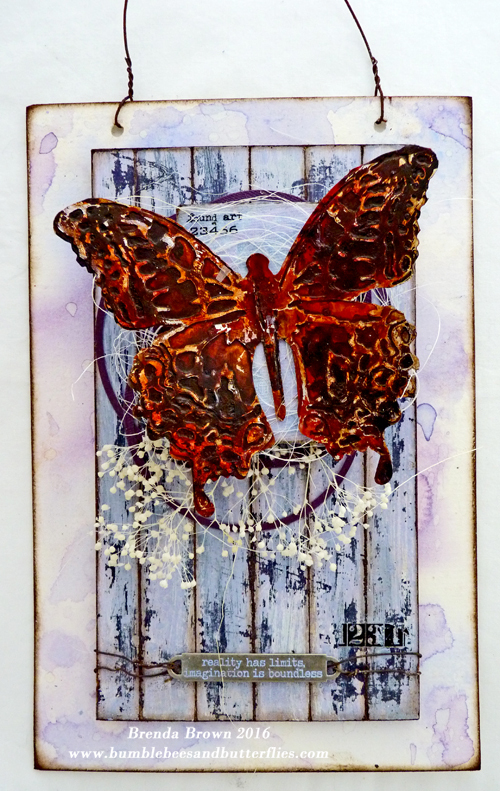 A fabulous chuny ATC Jennie, I love how you kept the lilac background muted and faded and kept those gorgeous embellishments centre stage. 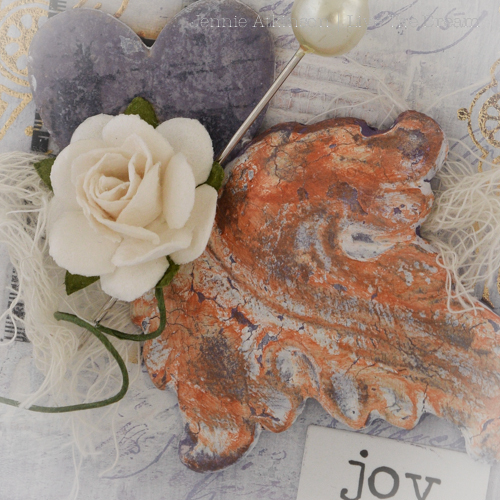 The foil really does add that something extra special as does the rusting on your paper clay, that's super cool. Love everything about this fantastic piece. FABULOUS! The muted background is so beautiful already and I just love the addition of the metallic rub ons! 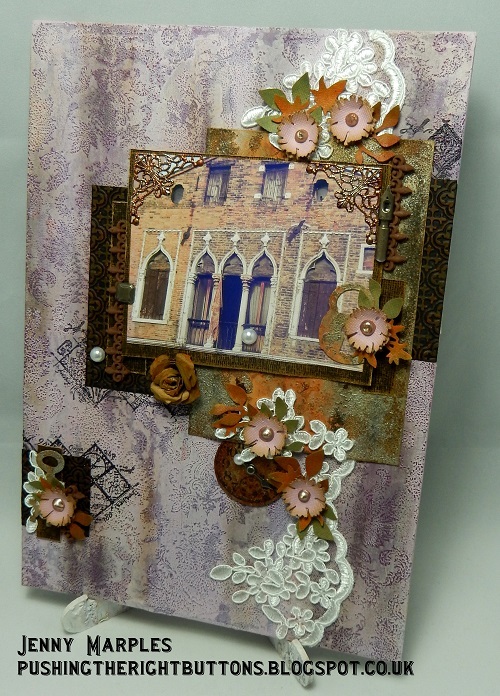 The rusted paper clay is genius and the composition of the chunky ATC just perfect! What a gorgeous make!! A great finale to this month's DIs! Fabulous! Jennie. Gorgeous detailed background in those lovely muted tones embellished so perfectly with such a wonderful arrangement of elements. You really have offered so much inspiration from such a small ( in size) project . Stunning Jennie, loving the design. 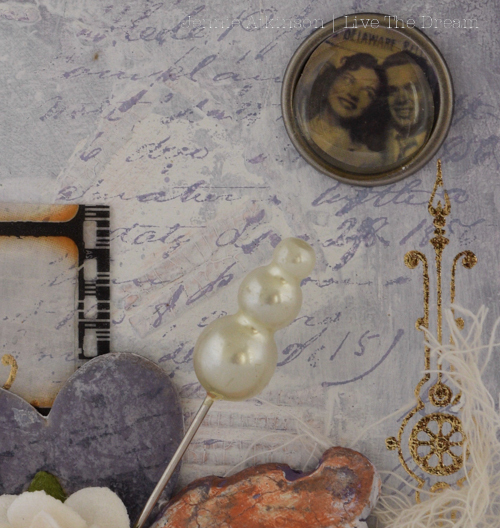 Oh Jennie, what a stunning ATC and your rusted paper clay is an amazing embellishment. Oh gosh...love the rusted paper clay. It looks fabulous and genuine. All four projects are amazing. So very different and each one has that special touch. 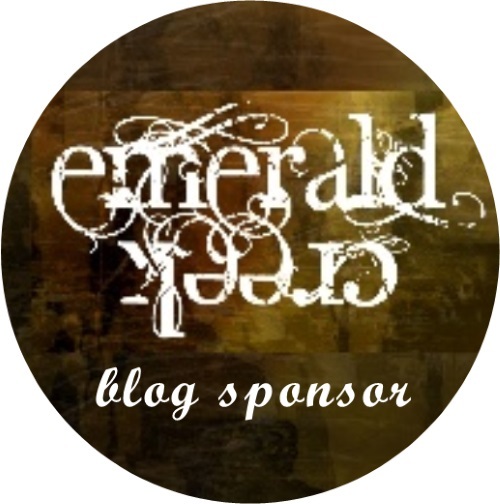 Thank you for sharing these projects. It's truly very inspirational.